DL: Ken Hubbs (2b), pulled groin, 1 day; Jim Bouton (sp), pulled groin, 2 days; Claude Raymond (rp), strained chest, 1 day; Wayne Granger (rp-Montana Wolves R), strained back, 4 days; Paul Blair (cf-Montana Wolves R), bruised ankle, 6 days. The Dusters traveled to New York's fabled Polo Grounds for their first road trip -- back-to-back series with New York Mets -- and got off on the right foot with a 10-1 drubbing of Casey Stengel's struggling crew. Starter Tony Cloninger got into trouble in the 4th, loading the bases after Ted Schreiber doubled in a run, but got the outs he needed to maintain Nevada's lead at 3-1. His mound opponent, Al Jackson, pitched well enough to keep the Mets in the game, allowing three runs on seven hits through the first six frames. But in the 8th, with the score 4-1, Tom Tresh cranked a three-run homer into the left field bleachers. Maury Wills opened the 9th with a double and scored on a Vic Power single before Billy Williams hit a two-run shot to left center to make it 10-1. Cloninger (6.2ip, 7h, 3bb, 1r, 1er, 3k, 2.41era) improved to 4-1. Wills went 2-for-5 with two runs scored, Power and Lee Maye were 3-for-5, Williams 2-for-4 and Tom Tresh 3-for-4. The Dusters tallied 15 hits in all. The only batter who didn't get one was Johnny Blanchard, who was 0-for-5. 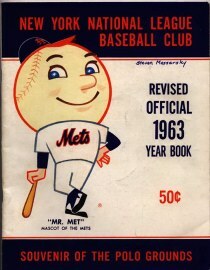 Mets right fielder Duke Snider finished 3-for-4. The Dusters had Mets starter Roger Craig on the ropes in the 1st, scoring a pair of runs and looking for more with the bases loaded -- until Ken Hubbs struck out to end the inning. Billy Williams homered in the 3rd and a RBI single by Hubbs in the 4th made it 4-0. Nevada's Dave McNally retired the first ten New York batters in order and didn't get into trouble until the 4th, when a hit and a pair of walks loaded the bases, but Harry Chiti grounded out to leave all three baserunners stranded. Johnny Blanchard hit a two-run dinger in the 6th and Ben Naylor, seeing no point in wearing out his starter with a 6-0 lead, turned to his bullpen. Jim Roland gave up a pair of runs in the 6th, and when he walked two in the 7th Nails had seen enough, and summoned Barney Schultz. The Mets scored a run in the 9th but it was too little too late. Gordy Coleman started at first in place of Vic Power and went 1-for-5, while Tony Oliva spelled Lee Maye in right field and finished 2-for-3 with a walk. It was the eighth homer for both Williams and Blanchard. McNally (5.2ip, 1h, 3bb, 0r, 0er, 2k, 3.03era) improved to 4-1. The Dusters were now 2.5 games ahead of the Cardinals atop the NL. Though Jim Bouton was healthy enough to come off the DL, the decision was made to give Phil Niekro another start, as Bouton's return would mean either Niekro or Pete Richert would go to the bullpen. Claude Raymond was fully recovered, as well, and back in the setup role. Leading 2-0, the Dusters added four in the 3rd -- Jerry Adair hit a three-run homer -- and two more in the 4th -- Hector Lopez clubbed a two-run shot into the left field bleachers of the Polo Grounds. But after Hobie Landrith and Cleon Jones had hit roundtrippers in the home 4th to make it 8-5, Niekro walked the next two batters and Ben Naylor replaced him with Pete Richert, who promptly served up a three-run homer to Jim Hickman. The Mets added another run in the inning and took a 9-8 lead. The Dusters tied in the game in the top of the 6th but New York scored two more in their half of the inning to regain the lead; in the 7th a three-run Lee Maye dinger made it 12-11 Nevada. In the 8th the Dusters tacked on three more runs without a hit, thanks to three Mets miscues. New York managed one more run in the bottom of the 9th against Bill Dailey, and Nevada held on to win 15-12 in a game in which each club collected seventeen hits and three home runs and used six pitchers. Niekro gave up seven runs on six hits in 3.1 innings. Barney Schultz got the win and Bob Duliba was awarded a save. Maye went 3-for-6 with three RBI, Lopez (starting in left field in place of Billy Williams) 4-for-6 with three ribbies. PIT traded Howie Goss (cf) to CLE for Whitey Herzog (rf) and Jack Kubiszyn (3b). BOS signed free agent Joe Hicks (rf). Jay Hook takes the mound for the Mets. In the middle of the first, Nevada leads 1 to 0. At the end of the first, New York trails 1 to 0. In the middle of the second, Nevada leads 2 to 0. 0 runs, 0 hits, 0 errors, and 2 left on base. At the end of the second, New York trails 2 to 0. 4 runs, 3 hits, 0 errors, and 0 left on base. In the middle of the third, Nevada leads 6 to 0. At the end of the third, New York trails 6 to 0. In the middle of the fourth, Nevada leads 8 to 0. 9 runs, 7 hits, 0 errors, and 0 left on base. At the end of the fourth, New York leads 9 to 8. The Mets brought the infield in. In the middle of the fifth, Nevada trails 9 to 8. At the end of the fifth, New York leads 9 to 8. 1 run, 2 hits, 1 error, and 2 left on base. In the middle of the sixth, the game is tied at 9. 2 runs, 3 hits, 0 errors, and 1 left on base. At the end of the sixth, New York leads 11 to 9. 3 runs, 3 hits, 0 errors, and 0 left on base. In the middle of the seventh, Nevada leads 12 to 11. At the end of the seventh, New York trails 12 to 11. 3 runs, 0 hits, 3 errors, and 1 left on base. In the middle of the eighth, Nevada leads 15 to 11. At the end of the eighth, New York trails 15 to 11. In the middle of the ninth, Nevada leads 15 to 11.